Traditional industries such as oil and gas have become more and more high-tech over the last decade. No longer is it about extracting the most oil possible; it’s about how to extract the oil as efficiently and cost-effectively as possible. Enter Hamid Alemohammad. Originally from Iran, Hamid came to Canada in 2006 to pursue a PhD in mechanical engineering at the University of Waterloo. Following the completion of his degree, he was awarded an eight-month Mitacs Accelerate internship in 2012 with a developer of customized test solutions for automotive components such as power steering equipment, fuel injectors, and throttle bodies. During his internship, Hamid co-invented the first optical fibre torque sensor embedded in electric motors. This unique sensor technology enables the measurement of mechanical torsion, or twisting, in the shaft of rotating machinery, such as electric motors. Hamid realized he was gaining the knowledge required to run a sustainable small business. “I developed strong leadership skills as I was responsible for engaging with domestic and foreign customers plus hands-on experience through conducting engineering needs assessment, evaluating the trade-offs between design and cost, conducting cost analysis, and preparing funding proposals,” he explained. Never having had aspirations to be an entrepreneur, Hamid considered launching a company with fellow researchers, Richard Liang and Amir Azhari. 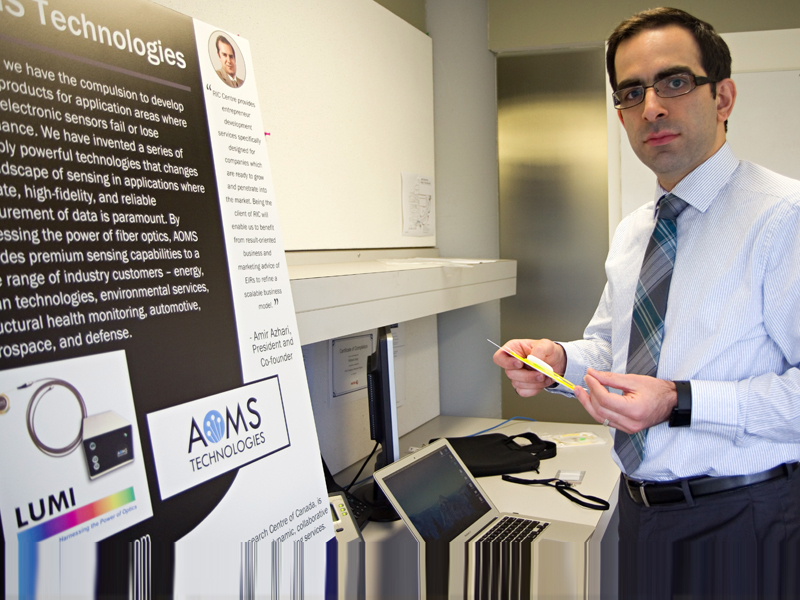 With the support of the Waterloo Commercialization Office, Professor Ehsan Toyserkani, and seed funding from the Ontario Centres of Excellence, the three partners established AOMS Technologies in 2014. AOMS Technologies develops sensing systems for application areas where existing sensors fail or lose performance. Leveraging the power of optics, AOMS provides an end-to-end hardware/software solution for harsh environments where temperature, pressure, and moisture fluctuate, such as deep below the earth’s surface. With broad applications in environmental remediation services, oil and gas production, power plants, and many more, the sensors use optical waves to gather and transmit data. However, the company achieved a major milestone in the summer of 2015 when it made its first big sale to an environmental services company.